RFID stands for Radio-Frequency Identification and refers to the use of radio waves to capture electronically stored information on a RFID card or tag. Charles Walton, Born in 1921 is best known as the first patent holder for the RFID (radio frequency identification) device. Many individuals contributed to the invention of the RFID, but Walton was awarded ten patents in all for various RFID-related devices, including his key 1973 design for a "Portable radio frequency emitting identifier". This patent was awarded in 1983, and was the first to bear the acronym "RFID". He charted the course that placed RFID on its path to wide-spread, worldwide deployment and commissioning, and for this, he earned the fitting title, The Father of RFID” Walton died in 2011 at the age of 89, he will be for ever immortalised in the history of RFID technology. RFID technology has two components – the reader and the RFID card. The reader has two parts – a transceiver and antenna. The reader sends energy to the card via radio waves, generating power via a phenomenon known as electromagnetic induction. The RFID card has two parts - an antenna and a microchip, connected together by a secure bond to make an integrated circuit. The microchip stores and processes data and the antenna receives and transmits data. Once energised the RFID card will transmit its data, usually its serial number, to the reader in a millisecond. Take an Oyster card for example, place an Oyster card near a suitable RFID reader, and an electromagnetic field is created between the reader and the chip in your Oyster card. This allows data to be transferred from the reader to your card, indicating that you’ve either started or finished a leg of your journey. The Oyster card receives data, and the reader records the RFID cards unique user ID, so you can think of it rather like a paper ticket being stamped. The reader also checks whether the card contains a valid Travel card or enough pay-as-you-go balance for the journey, and will then write data back to it. Like any technology RFID has a weakness, by transferring data across a radio signal you leave yourself open to fraud. Any low cost RFID reader or an NFC enabled smartphone in close proximity to your card can be used to steal your card number, expiry date and even the details of your last 10 transactions - this practice is known as credit card skimming. RFID cards, tags or wearables - what's best? This depends on the environment, your needs and budget. If you're tracking temperature sensitive goods we'd recommend RFID tags or if you want your festival to go cashless an RFID wristband is the perfect choice. RFID can be used in a variety of applications. 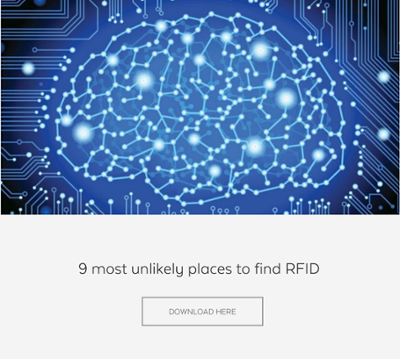 Download our free ebook to discover the 9 most unusual places RFID technology is used today.